1981-08-08. New. Ships with Tracking Number! INTERNATIONAL WORLDWIDE Shipping available. Buy with confidence, excellent customer service! 1973-04-06. New. Ships with Tracking Number! INTERNATIONAL WORLDWIDE Shipping available. Buy with confidence, excellent customer service! 1995-07-07. New. Ships with Tracking Number! INTERNATIONAL WORLDWIDE Shipping available. Buy with confidence, excellent customer service! Knopf. Hardcover. 0394473450 Ships from Tennessee, usually the same or next day. . New. 1974. 1981-08-08. Good. Ships with Tracking Number! INTERNATIONAL WORLDWIDE Shipping available. May not contain Access Codes or Supplements. May be ex-library. Shipping & Handling by region. Buy with confidence, excellent customer service! London: Michael Joseph, 1976. Dust jacket in very good condition with only slight edgewear to head, boards also in very good condition, pp very clean, binding sound, a very neat and tidy copy.. First Edition. Hard. Very Good/Very Good. Illus. by Stuecklen, Karl. 8vo. Knopf. Hardcover. 0394473450 New Condition. . New. Knopf. PAPERBACK. 0679755047 New Condition. . New. New York: Knopf. 1977. First Edition; Ninth Printing. Hardcover. 0394473450 . Very Good in a Very Good dust jacket. Owner name. ; 8 X 6.20 X 1.10 inches; 230 pages; Original unclipped dust jacket protected by archival Brodart cover. All domestic orders shipped protected in a Box. .
New York: Knopf. 1974. 2nd Printing before publication stated. Hardcover. 0394473450 . Near Fine in a Near Fine dust jacket. ; 8 X 6.20 X 1.10 inches; 230 pages; Original unclipped dust jacket protected by archival Brodart cover. All domestic orders shipped protected in a Box. .
New York: Knopf. 1974. BOMC; 2nd Printing before publication stated. Hardcover. 0394473450 . Very Good+ in a Very Good+ dust jacket. Owner bookplate. ; 8 X 6.20 X 1.10 inches; 230 pages; Original dust jacket protected by archival Brodart cover. All domestic orders shipped protected in a Box. .
RANDOM HOUSE INC. New. 8.06 x 6.19 cm. 1973-04-06. Good. Ships with Tracking Number! INTERNATIONAL WORLDWIDE Shipping available. May not contain Access Codes or Supplements. May be ex-library. Shipping & Handling by region. Buy with confidence, excellent customer service! New York: Knopf. 1980. First Edition; Twelfth Printing. Hardcover. 0394473450 . Very Good+ in a Very Good price clipped dust jacket. ; 8 X 6.20 X 1.10 inches; 230 pages; Original dust jacket protected by archival Brodart cover. All domestic orders shipped protected in a Box. .
1995-07-07. Good. Ships with Tracking Number! INTERNATIONAL WORLDWIDE Shipping available. May not contain Access Codes or Supplements. May be ex-library. Shipping & Handling by region. Buy with confidence, excellent customer service! Knopf. PAPERBACK. 0679755047 Like New Condition. . Fine. Ballantine Books, 1981-10-12. Mass Market Paperback. Used:Good. Seventh printing, February, 2004. Paperback edition. Fine condition, with no visible wear. Very minor stain on top edge of pages. Tight binding, with crisp, clean pages. 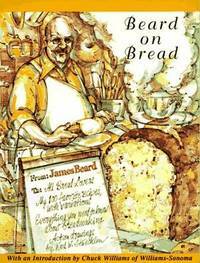 For everyone who wants to make wonderful, hearty, delicious breads, turn to the bread expert, James Beard. Step by step, with detailed instructions, . 256 pages. Knopf. PAPERBACK. 0679755047 Special order direct from the distributor . New. New York: Alfred A. Knopf, 1980. 12th printing. Hardcover. Very good condition/very good d.j.. Karl Stuecklen. 230, viii p., illus. Alfred A. Knopf. 1974. 6th printing. Pictorial boards in chipped, repaired dust jacket. VG..
New York: Alfred A. Knopf, 1974. Softcover. Near Fine. Sixth edition. 230pp., viii. Near fine in wrappers, a paperback. Knopf. PAPERBACK. 0679755047 . New. Knopf, September 1973. Hardcover . 7.5 Bulk HB Standard. Knopf. PAPERBACK. 0679755047 Minor shelf wear . Very Good. Knopf. PAPERBACK. 0679755047 signs of little wear on the cover. . Very Good. NY: Knopf. VG in G DJ. (1975). Chunk missing from top of DJ spine. .
Knopf. PAPERBACK. 0679755047 *LIKE NEW* Ships Same Day or Next! . Fine. Knopf. PAPERBACK. 0679755047 *BRAND NEW* Ships Same Day or Next! . New. Bound Brook, NJ: The Author, 1963. 136 pp. A solid ex-library copy with the usual markings. A history of the Bound Brook Presbyterian Church.. First Edition. Cloth. Good/Issued Without Jacket. 8vo - over 7¾" - 9¾" tall. Ex-Library. Ballantine Books, 1981-10-12. Mass Market Paperback. Good. Knopf. Hardcover. 0394473450 . Fair. 1974. Knopf. Used - Good. Good condition. Slightly dampstained. Knopf. Hardcover. 0394473450 Book is clean. Crisp pages. Tight binding. Moderate shelf wear on cover. Price sticker on the cover. . Very Good. Knopf, 1995-02-07. Paperback. Good. Excellent customer service. Prompt Customer Service. New York: Alfred A. Knopf. Fine copy. 1996. Later prt.. softcover. 8vo, 230 pp.+ index . Knopf. Used - Good. Ships from the UK. Former Library book. Shows some signs of wear, and may have some markings on the inside. 100% Money Back Guarantee. Your purchase also supports literacy charities. Knopf. Hardcover. 0394473450 Crisp pages. Tight binding. Tears and rips on dust jacket. Dirty edges. . Very Good. Knopf. PAPERBACK. 0679755047 hardback . Fair.